Mumbai, 4th November 2016: The stunningly elegant new S90 is Volvo’s entry ticket to the entrenched luxury sedan segment and marks a giant step forward for Volvo Cars better known for its SUVs and Estates. The S90 shakes up the luxury sedan segment with its distinctive executive package. It further reinforces the company’s credentials as a Swedish luxury car brand. Equipped with a host of new technology and features it bears testimony to the continuing transformation of the Volvo marquee in the luxury segment. 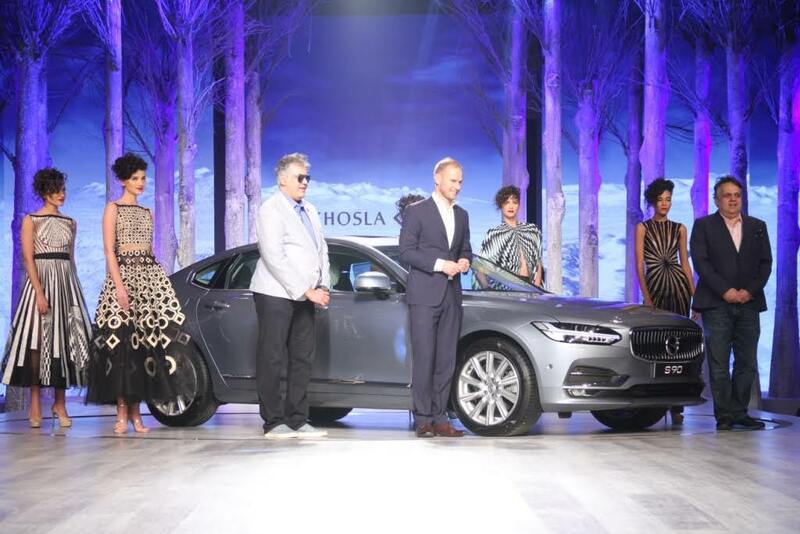 Khosla Jani ‘The Enchanted Collection’ ushered the New Volvo S90 luxury sedan at the launch event today. “Today we are making a clear statement of our intent to grow stronger in India – perhaps the most exciting and promising luxury car market in the World. The S90 delivers class-leading safety, bespoke Scandinavian design, and sublime comfort. Packed with features that envelope customers in luxury, we see tremendous response already for the much awaited launch.” Tom von Bonsdorff, MD, Volvo Auto India. Volvo S90 infuses freshness in the traditional luxury sedan segment with its distinctive Scandinavian design inside out. Based on the globally acclaimed ‘Concept Coupe’ the S90 exudes panache and clean design language. One-look and its difficult to keep your eyes away from this beauty. The concave elements in the chrome finished grille provides dimension to the bold and proud Volvo Ironmark flanked by the Full-LED Thor’s Hammer headlights. The sides of the car has an elongated passenger cabin to cue open spaces and the signature shoulder-line treatment resembles a luxury yacht. The rear has a new distinct tail lamp cluster and the Volvo spread out wordmark is a premium sign-off for the car. The Inscription variant comes with chrome finish exterior package that underlines premium imagery and the overall length – 4963mm makes it longest in the segment. The Volvo S90 interiors is luxury redefined. Attention to detail and exquisite materials has taken a new paradigm when it comes to the S90 interiors. From the finely crafted leather dashboard to the use of natural-finish walnut wood encased in a single piece chrome element that adorns the front console, everything about the interiors will make you feel special. The seat has soft perforated Nappa leather that enables heating and cooling through the seats. Both front seats have lumbar support and power adjustable seat extenders provide supreme comfort. The NVH levels shuts outside noise and cocoons the customers in serenity while the cabin comes with 4-Zone air-conditioning. The rear wheels feature independent air-suspension for going that extra mile in providing supreme comfort and ride. Our Interior Air Quality system enhanced with charcoal filter restricts particulate matter PM2.5 and PM10 to enter the S90 cabin. The S90 is equipped with a sub 2L diesel that delivers 190 horsepower and 400 Nm Torque. The engine is an inline 4 cyl turbocharged from the Drive-E family that optimises power, mileage and emissions. It is tuned to derive a balance between driving pleasure and driving comfort. The powertrain system is Euro 6 compliant and the exhaust manifold comes fitted with the Diesel Particulate Filter (DPF) that restricts the emission of particulate matter PM2.5 and PM10 by at least 95%. Volvo cars is the first car company in India that made DPF standard in all our cars since 2007. The future is smaller, cleaner and more powerful engines and our sub 2L strategy will be beneficial for the environment. In the centre of the dashboard is technology that makes life less complicated. The 9” touch display reduces the buttons to a mere 8, it is the most simple and intuitive system to use and enables the driver to concentrate more on the road. From car settings to entertainment and connectivity enables apps it has the industry’s most advanced tablet display. Built-in navigation and Apple CarPlay further enhances the experience. Ø Lane Keeping Aid – This is a unique feature for any car in India. The digital camera keeps an eye on the lane markers and if the driver does not provide steering input, the steering automatically corrects itself to keep the car within the lane. This feature is one-step closer to Autonomous Driving. Swedish luxury car company Volvo Auto India (VAI) established its presence in India in 2007 and has since then, worked intensively to market the Swedish brand in this country. Volvo Cars currently markets products through its dealerships in South Delhi, West Delhi, Gurgaon, Ahmedabad, Surat, Mumbai, Chandigarh, Coimbatore, Hyderabad, Chennai, Bangalore, Kochi, Vishakhapatnam, Kolkata and Vijayawada. Expanding soon to Lucknow, Pune and Jaipur. The company sells seven luxury models.